Engaging undergraduate students in research and creative activities has been advocated as an innovative strategy to promote student learning in higher education. 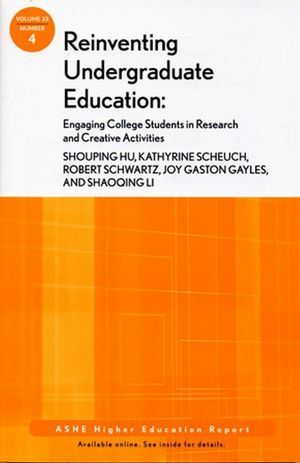 This monograph systematically synthesizes the literature to provide both conceptual and empirical evidence to demonstrate the effects of such engagement on student learning and development from higher education. Student engagement in research and creative activities during the college years is associated with a variety of outcomes in both the cognitive and affective domains. The evidence also points out that colleges and universities can make a difference in undergraduate engagement in research and creative activities. The authors provided various examples of how different types of institutions integrate inquiry-oriented activities in the curriculum, institutionalize research-supportive programs, and foster a campus culture that values inquiry-based undergraduate education. This is the fourth issue in the 33rd volume of the Jossey-Bass series ASHE Higher Education Report. Each monograph in the series is the definitive analysis of a tough higher education problem, based on thorough research of pertinent literature and institutional experiences. Topics are identified by a national survey. Noted practitioners and scholars are then commissioned to write the reports, with experts providing critical reviews of each manuscript before publication. Shouping Hu is associate professor of higher education in the Department of Educational Leadership and Policy Studies at Florida State University. Kathyrine Scheuch is a doctoral candidate in higher education at Florida State University. Robert Schwartz is associate professor of higher education in the Department of Education Leadership and Policy Studies at Florida State University. Joy Gaston Gayles is associate professor of higher education and student affairs in the Department of Adult and Higher Education at North Carolina State University. Shaoqing Li is senior research analyst in the Office of Institutional Research at Florida A&M University.